History of the L.A. Coalition | A Coalition for the Economy & Jobs in L.A.
Los Angeles, the nation’s second largest city, has a vibrant culture, a diverse population and a strong economy. The city is a leader in a number of important areas. It is the largest manufacturing center in the United States, a major financial and professional services center, the nation’s largest retail market, home to one of the world’s most important seaports and busiest airports and the entertainment and cultural capital of the United States. The city also houses extraordinary centers of higher education, medical research and care, apparel, tourism, manufacturing and design, technology and biotechnology, goods movement and more. Yet, for all of this economic activity, since its peak employment in 1995 the City of Los Angeles has declined by almost 30,000 jobs. In the past 17 years, Los Angeles has lost a net of 106,446 manufacturing jobs, a large majority of which were in the aerospace and high tech industries. Manufacturing jobs continue to be on a steady decline. After its first 15 months of work, the Los Angeles Economy and Jobs Committee produced a wide-ranging set of 100 recommended steps the City of Los Angeles can take to nurture and grow its economy and jobs. 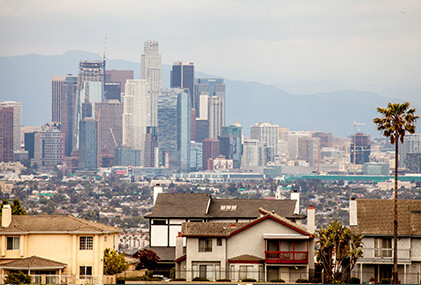 In its effort to investigate obstacles to economic growth and job creation, the committee took a comprehensive look at the Los Angeles business climate, identifying critical needs and prioritizing opportunities for growth. The committee’s recommendations were organized into ten categories aimed at creating more jobs and building a stronger economy in Los Angeles. Areas of focus included LAX, Port of Los Angeles, Workforce Development, South Los Angeles, Building/Land Use, Business Climate, State/Federal investments, Government Reforms, and Eight Sector Strategies. It was a remarkable report with some remarkable results – in no small part due to the creation and leadership of the L.A. Coalition. The L.A. Coalition has publicly and privately educated decision makers and partnered with many organizations to maintain momentum on the recommended investments and reforms. The modernization of LAX is a major economic driver. By 2023 more than $14 billion will be spent to renovate and rebuild the airport. 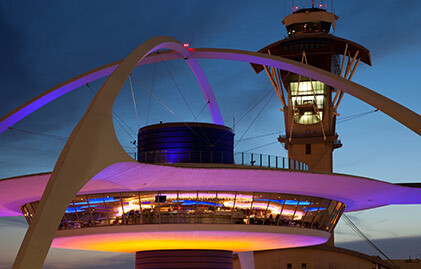 A recent study by LAEDC found that LAX’s operations create 620,610 local jobs, and its on-going capital- improvement program has created another 121,640 annual jobs, generating $37.3 billion in labor income, $126.6 billion in business revenues (output), $6.2 billion in state and local taxes, and $8.7 billion in federal tax revenues. The airport also purchased more than $1.9 billion in goods and services in fiscal years 2014 and 2015. The America Fast Forward project is building out 12 major public rail lines – with $14 billion dollars in projects throughout the Los Angeles region and future plans for another $30 billion in investments. In addition, the L.A. Coalition supports reforms that will allow federal funds to be leveraged for local jobs, including making permanent a federal pilot program that allows local transportation agencies to consider hiring local workers for transit and highway projects that use federal funds. Currently, local agencies that receive federal funds can only consider income, not geography, when hiring workers. This investment will translate into tens of thousands of well-paying jobs for Angelenos, putting these tax dollars back into the communities that paid for the projects. The pilot for the Southwestern Yard has the following hiring goals: 40 percent community/local area workers; 20 percent apprentice workers; and 10 percent disadvantaged workers. Transit-oriented development and affordable housing are significant economic drivers in Los Angeles. For example, the Los Angeles Metropolitan Transportation Agency is setting aside 35 percent of its own land for affordable housing. Metro will sell the land at below market rates to entice developers to build apartments near transit hubs for low-income residents. Eight-five percent of Metro riders are low-income and struggle to pay Los Angeles rents and therefore are living in more suburban areas. Workers who earn less than $25,000 and live within half a mile of a transit station are three times more likely to take transit than those who earn more than $75,000 and live close to a station. The L.A. Coalition worked with the L.A. Tourism and Convention Board, in conjunction with the region’s tourism offices, and is moving forward with a campaign to increase the number of visitors to L.A. by 8.5 million by 2020. This ambitious plan will attract more than 50 million total visitors to the region by 2020 and will support a total of 392,000 jobs (68,000 new ones), generate $634.7 million in new Transient and Occupancy Taxes and $1.55 billion in other local sales taxes. The total economic benefit to the region will be $44.5 billion when visitor’s overall spending on local transportation, lodging, food, beverages, entertainment, shopping, etc. is added into the equation. More than $2.6 billion is now being invested in America’s premier port and Southern California’s gateway to international commerce. The Port of Los Angeles is committed to developing innovative strategic and sustainable operations that benefit Southern California’s economy and quality of life. As North America’s leading seaport in terms of container volume and cargo value, the Port of Los Angeles facilitated $270 billion in trade during 2015. Port operations and commerce facilitate more than 133,000 jobs in the City of Los Angeles and 479,000 jobs in the five-county Southern California region. 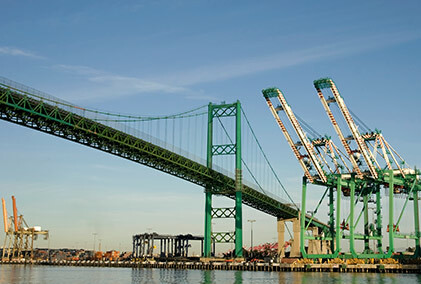 The San Pedro Bay Ports support more than 1 million California jobs and 2.8 million nationwide.